The Oldsmobile heads to the blaster, gets some metal work, and a top-end prefabbed chassis. Flashback covers a super-fine 442. 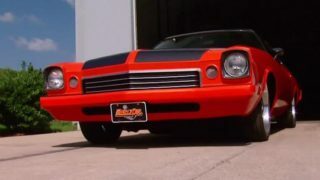 (ANNOUNCER)>> TODAY ON MUSCLE CAR, TOMMY TAKES OUR PROJECT OLDSMOBILE ON A FIELD TRIP FOR A SUIT OF ARMOR. 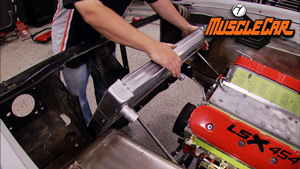 THE GUYS START RIPPING INTO THE METAL WORK, AND THE KING OF AFTERMARKET CHASSIS' SHOW US WHAT HE'S GOT UP HIS SLEEVE FOR THE OLDS. 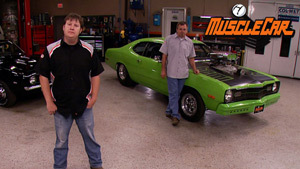 MUSCLE CAR STARTS RIGHT NOW! '69 OLDSMOBILE AND IF YOU REMEMBER CORRECTLY, OUR PLANS ARE GONNA BE RATHER EXTENSIVE. WE PICKED THIS CAR UP IN LOUISVILLE, KENTUCKY, TOOK IT HOME, AND SPENT SOME TIME TEARING IT APART. OUR GOAL IS TO MAKE THIS RIDE INTO A MODERNIZED ALL CUSTOM RESTO MOD AND A STYLIZED TRIBUTE TO THE CLASSIC HURST EDITION OLDSMOBILE. THIS IS GONNA BE A LONG TERM FRAME OFF LABOR OF LOVE. WE GOT ALL THE SHINIES PULLED OFF AND THE BODY SEPARATED FROM THAT TIRED, OLD, WORN OUT THING CALLED A FRAME, AND BROUGHT IT ALL OVER TO OUR BUDDIES AT BLAST FROM THE PAST IN LEBANON, TENNESSEE. Y'ALL MAY REMEMBER OLE VANCE. HE HELPED US OUT ON SEARCH AND RESTORE WITH ANDY WILSON'S CHEVY TWO. HEY MAN, THANKS FOR HELPING US OUT. (VANCE)>> HEY, NOT A PROBLEM. GONNA BE BACK BECAUSE I'VE GOT TO SEE YOUR TRICK ON SEALING UP THAT STEEL. (VANCE)>> SURE THANG, WE'LL HAVE IT DONE IN A COUPLE OF DAYS. (TOMMY)>> WELL IT'S BEEN A FEW DAYS SINCE WE DROPPED OUR OLDSMOBILE OFF. I WONDER WHAT THE BLASTER'S GONNA REVEAL. HOPE IT'S NOTHING LIKE SWISS CHEESE. YOU NEED TO ONCE OVER WITH A BLOW HOSE AND A VACUUM TO GET ANY LEFT OVER MEDIA OUT OF THE NOOKS AND CRANNIES. CLEANLINESS IS A MUST BECAUSE WE'RE GONNA HAVE THIS CAR BODY POWDER COATED WITH A SPECIAL KIND OF POWDER THAT ACTS AS A PRIMER. AFTER THEY BLEW THE CAR OUT, THEY ROLLED INTO THE BAKE OVEN TO COOK IT FOR A JUST A BIT. VANCE, WHY EXACTLY DO YOU GUYS DO THAT? (VANCE)>> WE PREBAKE IT TO KEEP ANY IMPURITIES FROM BAKING OUT DURING THE POWDER BAKE CYCLE. THAT WAY IT PREVENTS OUT GASSING OR ANY BLISTERS IN THE POWDER. (TOMMY)>> WELL IT LOOKS A LOT BETTER THAN THE LAST ONE WE'VE GOT BLASTED. (VANCE)>> YEAH, IT DON'T LOOK LIKE THERE'S HARDLY AS MUCH RUST IN THIS ONE. (TOMMY)>> THE PANS HAVE GOT A LITTLE RUST IN THEM. (VANCE)>> IT'S LIKE IT'S GOT SOMETHING AROUND THE WINDOW FRAME. YEAH, AIN'T NOTHING THE PROFESSIONALS CAN'T HANDLE. (TOMMY)>> WELL I WOULDN'T CALL ME NO PROFESSIONAL BUT I'VE SEEN IT DONE ONCE OR TWICE. (VANCE)>> THAT RIGHT THERE'S SOME OF THE IMPURITIES, SOME OF THE SEAM SEALER BAKING OUT THAT WE WAS TRYING TO PREVENT IN OUR POWDER. CAN HOOK UP THE GROUNDING CLAMP AND START COVERING OUR OLDS WITH POWDER. POWDER'S ATTRACTED TO THE METAL. YOU CAN GET IT INTO PLACES THAT YOU'D NEVER BE ABLE TO GET ANY KIND OF SPRAY ON PRIMER. IT'LL GET INSIDE THE DOORS, BEHIND THE INNER STRUCTURES, YOU NAME IT, AND THAT MAKES FOR A MUCH MORE WELL PROTECTED PIECE OF METAL. SO WHAT IS THE BENEFITS OF USING THIS TYPE OF PRIMER? (VANCE)>> THE PRIMER, IT'S A NOT OUT GASSING PRIMER AND IF THERE'S ANY IMPURITIES, IT TENDS TO KEEP THE BUBBLING FROM COMING IN THE ROUGHNESS. IT STOPS THAT. (TOMMY)>> HOW DOES IT SAND, IT BEING A PRIMER? WE'RE PRETTY MUCH USED TO YOU KNOW, YOUR URETHANE SPRAY ON STUFF BUT WE NEVER USED A POWDER COAT. (VANCE)>> YOU CAN SAND IT NO PROBLEM. THE POWDERS TEND TO BE A LITTLE BIT HARDER THAN ANY PAINTS AS FAR AS PRIMERS GO. IT BAKES ANYWHERE FROM 350 FOR SAY 20 MINUTES, OR AROUND 400 FOR 10 MINUTES. THE RAIN, OR WHATEVER. THE BLASTING AND POWDER TOGETHER WILL RUN A GUY ABOUT $1,800 BUCKS. AND FOR THE TIME YOU SAVE STRIPPING AS WELL AS THE INCREASED PROTECTION, THAT AIN'T BAD AT ALL. SHE'S SEALED UP LIKE A TIME CAPSULE, AND WE COULD TAKE OUR SWEET TIME GOING AFTER THE METAL WORK IF WE WANTED TO, BUT I THINK I SEE A GOOD PLACE TO START. (ANNOUNCER)>> AFTER THE BREAK, A QUADRUPLE QUARTER PANEL BYPASS. AND LATER ON, A 442 THAT TURNS HEADS WHEREVER IT GOES, STICK AROUND! (RICK)>> HEY GUYS, WELCOME BACK. WE'VE GOT OUR OLDS HERE ALL STRIPPED DOWN, BLASTED, COATED, AND BACK IN THE SHOP. NOW IT'S TIME TO GET ROLLING ON THE METAL WORK, AND WE FIGURE WHAT BETTER PLACE TO START THAN THE QUARTER PANELS. (TOMMY)>> THIS CAR'S HAD QUARTERS PUT ON IT AT SOME POINT IN TIME, AND IT LOOKS LIKE WHOEVER DID IT DIDN'T HAVE A WHOLE LOT OF EXPERIENCE AT IT. THE WELDS LOOK LIKE THEY FORGET TO EITHER TURN THE GAS ON, WELDED OVER THE TOP OF SOME DIRTY STEEL, OR THEY USED SOME FLUX CORE WIRE. BUT EITHER WAY, IT MAY LOOK BROKE BUT IT AIN'T PLUM BROKE UNTIL YOU CAN'T FIX IT NO MORE. WHAT YOU WANT TO DO IS GRIND THE WELD DOWN SO THAT IT'S FLUSH LIKE THE REST OF THE METAL. YOU DON'T WANT TO GRIND IT TOO MUCH CAUSE YOU'LL MAKE THE EDGE PAPER THIN AND THAT MAKES IT IMPOSSIBLE TO WELD. NEITHER ONE OF THE QUARTERS ON THIS CAR ARE ANYTHING TO WRITE HOME ABOUT. RICK'S GONNA JUMP IN ON THE ACTION TOO. (RICK)>> I WROTE DOWN KIND OF A STRAIGHTER MARK THAN WERE THE ORIGINAL WELD WAS. THIS IS SO GOOBERED UP AND OFF CENTER AND EVERYTHING ELSE. SO I'M JUST GONNA KIND OF STRAIGHTEN THIS LAP OUT A LITTLE BIT AND MAKE IT LOOK PRETTY! IT'S GREAT TO GET A COUPLE OF EXPERIENCED GUYS CHURNING ALONG ON ONE PROJECT CAUSE IT REALLY HELPS THINGS MOVE ALONG NICE AND FAST, BUT THERE CAN BE CONSEQUENCES TO WORKING IN A SMALL AREA. (TOMMY)>> WE GOT THOSE TWO PANELS FLUSH, WE CAN START TACKING IT UP AND WE WALK THAT PANEL ALL THE WAY IN. I'LL INCH MY WAY UP THE PANEL MOVING THE METAL WHERE IT NEEDS TO BE. TACK IT INTO PLACE. THEN DO THE SAME THING A LITTLE FURTHER DOWN THE LINE. THIS CAN BE A TEDIOUS PROCESS. YOU JUST HAVE TO BE PATIENT AND TAKE YOUR TIME. IN A SPOT LIKE THIS WHERE YOU CAN'T GET BEHIND THE METAL EASILY, FASTEN A STUD TO THE PANEL SO YOU CAN PULL IT OUT. WE'RE GONNA HAVE TO DO A LITTLE BIT OF SHRINKING CAUSE THIS PANEL'S KINDA BUNCHED UP HERE IN THE MIDDLE, WHICH ISN'T ALL THAT BIG A DEAL. I CAN CUT THE LAST PART OF THE PANEL FREE. THAT WAS A LOT OF OVERLAP. THEN IT'S JUST A MATTER OF BUTTING THEM TOGETHER AND HELPING THEM BECOME FRIENDS. JUST REMEMBER NOT TO WELD IN ONE SPOT TOO LONG OR YOU'LL WARP THE PANEL. WELL THERE YOU GO. WE MANAGED TO SAVE THE QUARTERS EVEN THOUGH THEY WEREN'T INSTALLED IN THE BEST WAY, AND ALL WE HAD TO DO WAS SPEND A LITTLE BIT OF TIME. WE HAD NEW ONES JUST IN CASE WE NEEDED THEM, BUT IT LOOKS LIKE WE'LL BE ABLE TO SEND THEM BACK AND EXCHANGE THEM FOR SOME PARTS WE'LL NEED LATER DOWN THE ROAD. (ANNOUNCER)>> STILL AHEAD AN ALL NEW FLASHBACK THAT SHOWCASES SOME OLD SCHOOL OLDS FOR YOU. PLUS A SUPER HIGH END CHASSIS FOR OUR OWN OLDSMOBILE BUILD. A 1969 OLDS 442 W-30. (TONY)>> THERE'S NO BIGGER THRILL THAN GETTING BEHIND THE WHEEL, PUTTING THE TOP DOWN, AND JAMMING SOME GEARS. (TOMMY)>> OWNER TONY BONIFIDE KNOWS WHAT HE'S TALKING ABOUT. HE DRIVES THIS ULTRA RARE '69 442 ANY CHANCE HE GETS, AND HE AIN'T NO SUNDAY DRIVER. (RICK)>> PLUS IT'S NOT YOUR STANDARD 442. IT'S OUTFITTED WITH THE KILLER W-30 OPTION, A RACE SETUP FIRST OFFERED IN '65. THE HEART OF THE "W" MACHINE IS THE FORCE AIR INDUCTION SYSTEM. TWO SCOOPS UNDER THE FRONT BUMPER FUNNEL AIR THROUGH DUCTS INTO THE DUAL SNORKEL AIR CLEANER. 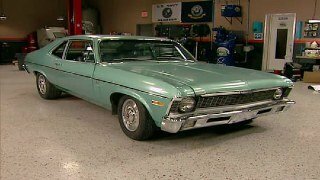 FOR '69 ONLY THE TUBES HAD AN AUTO TURN VALVE TO CHANNEL WARM AIR FROM THE EXHAUST TO HELP HEAT UP THE ENGINE. (TOMMY)>> THE W-30 CAME WITH AN EXCLUSIVE RAM ROD 400 VEIGHT, SERIOUSLY UNDERRATED AT 360 HORSEPOWER. 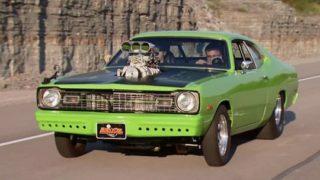 IT IMPROVED ON ITS STANDARD 442 MOTOR WITH A HIGH OVERLAP CAM, DEEP PORT CYLINDER HEADS, AND LARGER INTAKE AND EXHAUST PORTS. THE WHOLE SETUP SHAVED ALMOST TWO SECONDS OFF THE CAR'S QUARTER MILE TIME, CLOCKING A 13.3 AT 103 MILES AN HOUR. (RICK)>> APART FROM THE BADGING AND THE SCOOPS, THERE ARE A FEW SUBTLE WAYS TO ID A TRUE W-30 FROM THE OUTSIDE. FIRST, THE INNER FENDER WELLS SHOULD BE MADE OF RED PLASTIC. WHY RED PLASTIC? WELL NO ONE REALLY KNOWS BUT IT SURE LOOKS COOL. AND SECONDLY, ONLY W-30'S GOT SOLID RALLY STRIPES ON THE HOOD. LASTLY THE TRUNK LID SHOULD HAVE A DUAL PIN STRIPE INSTEAD OF A SINGLE ONE. HER HEADLIGHTS WERE CLOSER TOGETHER. 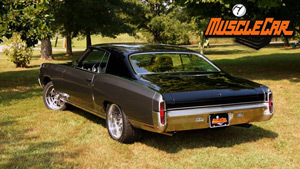 THE BACK WAS RESTYLED WITH VERTICAL TAILLIGHT LENSES AND THE OLDSMOBILE LETTERING WAS GONE. 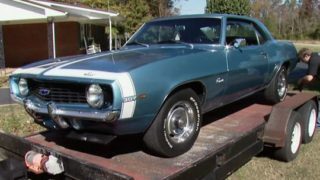 (RICK)>> THE 442 MODEL STILL GOT YOU A FOUR BARREL CARB, FOUR ON THE FLOOR, AND DUAL EXHAUST. PLUS THERE WAS THE RALLY SUSPENSION ROLLING ON F-70 BY 14 WIDE OVALS WITH A SET OF HEAVY DUTY SIX INCH RIMS. (TOMMY)>> INSIDE THE STYLISH INTERIOR INCLUDED STRATA BUCKET SEATS AND A DELUXE STEERING WHEEL. PLUS THERE'S ROCKET RALLY PACK GAUGES WITH A TICK TOCK TACH AND A STEREO WITH AN EIGHT TRACK PLAYER. (RICK)>> EVER SINCE THE 442 WAS INTRODUCED IN '64, OLDS NEVER GOT TOO CREATIVE WHEN IT CAME TO ADVERTISING. NOTICE ANY PATTERNS HERE? WELL THAT ALL CHANGED IN '69. DOCTOR OLDSMOBILE, A BMOVIE MAD SCIENTIST WAS DREAMED UP TO SELL THE NEW "W" MACHINES AS MONSTROUS LAB EXPERIMENTS. WACKY SIDE KICKS LIKE ELEPHANT ENGINE ERNIE AND SHIFTY SIDNEY LATER JOINED THE CAST. (TOMMY)>> DESPITE THE POPULAR AD CAMPAIGN, SALES OF THE 442 DIPPED TO JUST UNDER 30,000. 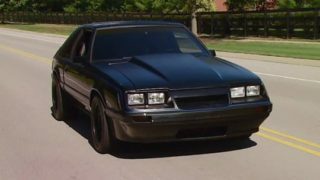 4.300 WERE RAG TOPS AND OF THOSE, ONLY 91 HAD THE W-30 OPTION AND A FOUR SPEED. THAT MAKES THIS ONE RARE, BONAFIDE PIECE OF AMERICAN MUSCLE. (TONY)>> IT'S A FUN CAR TO DRIVE. IT'S GOT A LOT OF PEP, A LOT OF POWER. (ANNOUNCER)>> COMING UP THE KING OF AFTERMARKET CHASSIS' MAKES A VISIT TO OUR STUDIO. (TOMMY)>> HEY Y'ALL, WE WANT TO DO THIS OLDS BUILD UP THE RIGHT WAY. WE'RE GONNA USE THE BEST PARTS POSSIBLE. SO WHEN IT CAME TO A CHASSIS, WE KNEW THERE WAS ONLY ONE PLACE TO GO. SHE CAME IN A CRATE, AND WHEN YOU GET TO LOOKING AT IT, YOU KNOW THAT THE GUYS PUTTING THIS THING TOGETHER KNOW WHAT THEY'RE DOING. (RICK)>> THE STOCK CHASSIS WAS FINE AND DANDY BACK IN THE DAY BUT THE ORIGINAL SUSPENSION GEOMETRY WAS A LOT LESS THAN PERFECT ON THESE OLD CARS. AND WITH THE POWER THAT YOU CAN SQUEEZE OUT OF A MODERN LS MOTOR, ODDS ARE YOU'RE GONNA TWIST THIS DUDE UP LIKE A PAPER CLIP. WE'VE GOT THIS ONE ALL TAKE OUT AND READY FOR A LITTLE ATTENTION, AND WE'RE ALSO LUCKY ENOUGH TO HAVE THE GUY HERE IN HOUSE THAT DESIGNS THESE THINGS, ART MORRISON FROM ART MORRISON ENTERPRISES. (ART)>> WELL THANKS RICK, GLAD TO BE HERE. (RICK)>> HEY GLAD TO HAVE YOU HERE MAN. IN THE WORLD OF AFTERMARKET CHASSIS AND FABRICATION, WELL FOR THE LAST 40 YEARS THIS GUY HAS BEEN KING OF THE HILL. (ART)>> THE FRAME WE HAVE HERE IS A '68 TO '72 ABODY FRAME. IT PRETTY MUCH FITS EVERYTHING FROM THE CHEVELLE, BUICK, OLDS, PONTIAC. ANYTHING THAT IS CONSIDERED AN ABODY FROM '68 TO '72. IT WAS A VERY, VERY INVOLVED ENGINEERING PROCESS JUST BECAUSE OF THE DESIGN OF THE CHASSIS. THERE'S WAS A LOT OF COMPLICATED PIECES. OVERALL PROJECT WAS PROBABLY A TWO YOUR FROM START TO FIRST PROTOTYPE CHASSIS. 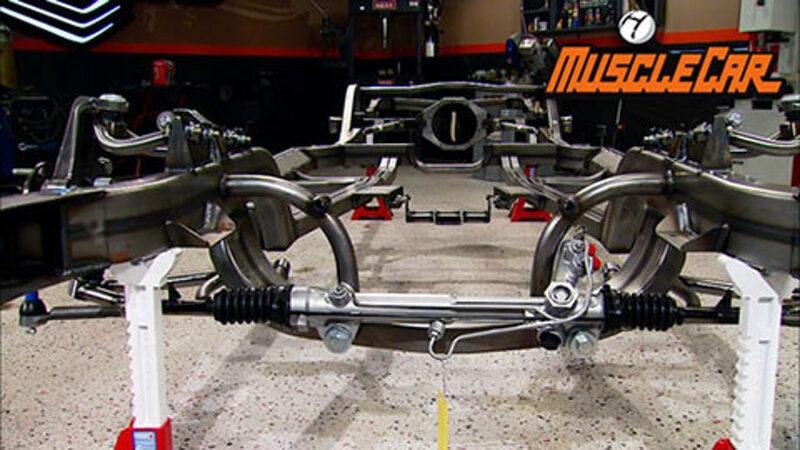 (RICK)>> WHILE WE PUT THIS SWAY ON, WHY DON'T YOU GIVE THE LOW DOWN ON THIS FRONT SUSPENSION. FOR THE LS TYPE ENGINES. MOTOR MOUNTS, THEY TIE IN FROM THE CROSS MEMBER TO THE MAIN RAIL JUST TO GIVE THE OUTSIDE OF THE FRAME MORE STRUCTURE. ANOTHER THING THAT WE'VE DONE IS ON THE STEERING ARMS WE'VE ACTUALLY MILLED OFF THE STOCK STEERING ARM, MACHINED THE BACK SIDE OF THE UPRIGHT TO ACCEPT THIS DROPPED STEERING ARM. AND THE REASON FOR THE DROPPED STEERING ARM IS TO GET THE RACK AND PINION LOW ENOUGH WITHOUT HURTING THE GEOMETRY OF THE SUSPENSION, AGAIN TO ALLOW CLEARANCE FOR THE ENGINE. (RICK)>> AND YOUR TIE ROD AND YOUR CONTROL ARM ARE, I MEAN IT'S NOT GONNA GET MUCH MORE PERFECT THAN THAT, PERFECTLY ALIGNED. IT'LL BASICALLY HAVE ZERO BUMP STEER. (ART)>> YEAH ONE OF THE OTHER THINGS WE DO IS WE BOX THE END OF THE FRAME ON BOTH SIDES JUST TO KEEP ANY WATER, MATERIAL, DIRT, ANYTHING FROM GETTING DOWN INSIDE THE FRAME RAILS ONCE THE CAR'S FINISHED. CLEARANCE FOR THE ENGINE. WE USE STRANGE ENGINEERING SHOCKS ON ALL FOUR CORNERS OF OUR CHASSIS. THEY ARE AN ADJUSTABLE SHOCK. (TOMMY)>> NOW WITH THE FRONT END ALL ASSEMBLED, CAN YOU TELL ME WHAT WE'VE GOT GOING ON BACK HERE? (ART)>> ABSOLUTELY, WHAT WE'VE DONE IS, A COUPLE OF THINGS. IT'S WHAT WE REFER TO AS A TRIANGULATED FOUR BAR. WE USE A LARGE DIAMETER TUBE AND WE'VE DONE THIS OVER THE YEARS BECAUSE WE'VE FOUND THAT IT REDUCES THE HARMONICS OF ACTUALLY ABUSING THE SMALLER TUBES. LETS GET TO IT AND WE'LL ASSEMBLE THE REAR END. (RICK)>> WELL ART, YOU AND I BOTH KNOW, YOU CAN HAVE THE BEST SUSPENSION PARTS IN THE WORLD BUT IF YOU HANG THEM OFF A STOCK FRAME THEY'RE NOT GONNA WORK VERY GOOD. SO WHAT DID YOU GUYS DO TO STIFFEN UP THE CENTER OF THIS THING? (ART)>> WHAT WE DID TO GAIN STRENGTH ON THIS, ONE OF THE MAIN ITEMS IS WHAT WE CALL THIS TORQUE BOX AREA. THERE'S A PIECE OF TWO BY FOUR, 180 WALLED, THREESIXTEENTHS WALL MATERIAL THAT IS FORMED AROUND HERE, AND THEN THIS IS ALL ENCASED IN MORE EIGHTH INCH MATERIAL. WHAT WE'VE DONE WITH THE SIDE RAIL IS WE'VE COMPLETELY BOXED IT SIMILAR TO IF IT WAS UNDERNEATH JUST STRICTLY A CONVERTIBLE. ALONG WITH THAT WE PUT IN THESE EXTRA PIECES HERE. THE EXHAUST PASSES UNDERNEATH HERE. IT ALLOWS THE TRANSMISSION CROSS MEMBER AND TRANSMISSION TO COME OUT WITHOUT HAVING TO FUSS WITH THE EXHAUST. A STOCK CHEVELLE, THE CROSS MEMBER GOES ACROSS THE EXHAUST. SO IT WINDS UP BEING A REAL STRUGGLE THAT WAY. UNDERNEATH OUR LATEST RIDE. A HUGE THANK YOU TO ART MORRISON FROM ART MORRISON ENTERPRISES. (ART)>> HEY RICK, NOT A PROBLEM, GLAD TO BE PART OF THE PROJECT. (RICK)>> HEY, A BIG HONOR MAN. WELL GUYS, YOU'VE SEEN THE BODY AND THE ATTENTION TO DETAIL WE'RE GIVING IT, AND YOU'VE SEEN THE CHASSIS THAT THAT BODY'S GONNA BE SITTING ON. FROM HERE ON OUT IS WHERE ALL THE REAL WORK STARTS. BUT FOR THIS WEEK WE'RE ALL OUT OF TIME. NOW IF YOU HAVE ANY QUESTIONS ABOUT ANYTHING YOU'VE SEEN ON THE SHOW TODAY, YOU CAN CHECK IT ALL OUT AT POWERBLOCK TV DOT COM. BUT FOR THIS WEEK WE'RE OUTTA HERE. HEY ART, HOLD UP MAN, I'LL BUY YOU A BEER. (ANNOUNCER)>> YOU MAY BE WONDERING WHY WE NEED SUCH A SERIOUS CHASSIS FOR THIS BUILD. WELL I CAN GIVE YOU 454 REASONS WHY. THIS GM PERFORMANCE LSX IS JUST ONE REASON TO KEEP TUNED IN FOR OUR OLDSMOBILE BUILD ON AN UPCOMING EPISODE OF MUSCLE CAR.